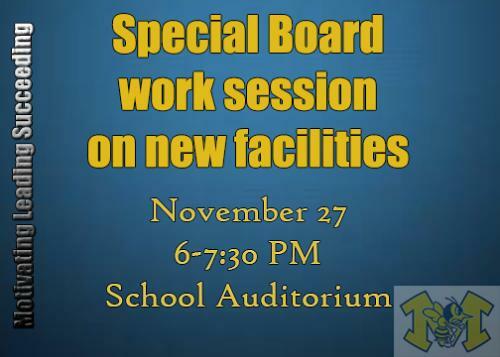 On behalf of the Monroe Local School Board, I would like to invite you to attend a special board work session that will focus on new facilities. The meeting will held on the evening of November 27, from 6:00 to 7:30, at the Monroe High School Auditorium. This is the second open meeting where the board will share information about the anticipated construction of a new school building to accommodate our growing student enrollment. We know that we qualify for 49% matching funds from the State for the construction. The board is considering whether it is best to build the new school on the site of our current 2-12 building on Yankee Road, or on the site of the K-1 primary school on Macready and Elm. The board will also be discussing the grade configuration of the new building. They are considering the merits of a new high school, middle school, or elementary school. This is scheduled as a board work session, and there will be opportunity for sharing your thoughts and questions with the board at the meeting. Please consider joining us for this important meeting.